Robservations – the Blog of Robert Booth » Man solves 3 Rubik’s cubes whilst juggling them! 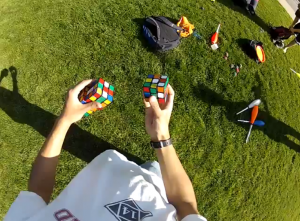 Man solves 3 Rubik’s cubes whilst juggling them! I could not believe this video – it is a bit long (about 6 minutes) but you should at least watch him start juggling them and watch him finish with 3 solved Rubik’s cubes..
No idea how this is possible! He’s a Stanford University student, by the way, so he’s obviously pretty smart. Click image below to see the video – enjoy!